> Arts A Blast: Create your own art class! Be enlightened and engaged by the wonders and challenges of art making. Enroll in one of the W. Charles Thompson Museum School art classes workshops or summer/vacation art sessions at the Attleboro Arts Museum. The Museum offers a variety of hands-on arts experiences for all ages. Our award-winning faculty members are experienced arts educators that thrive in the classroom. Tuition includes exposure to/discussions of professional artwork in the Museum’s Ottmar Gallery. Classes and workshops are scheduled throughout the calendar year. We are firmly committed to providing exciting arts experiences to students of all ages, and aim to expose promising and professional artists to the wonders of art making and the joys of imaginative thinking. In order for our art classes to operate safely and efficiently, we ask that all students and parents/guardians read and become familiar with the policies and guidelines within our handbook. A fully completed handbook signature page is required on the first day of each art class session. Thank you. 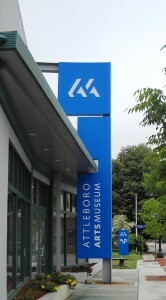 Download the W. Charles Thompson Museum School at the Attleboro Arts Museum Art Student Handbook. The signature page is the last page in the file. Please read our Handbook and familiarize yourself with our guidelines and policies and before registering for all classes, summer/vacation art sessions and workshops. Thank you. Feel free to call us at 508.222.2644 x10 with questions.